We believe that we can help make a difference in our communities and around the world. While successful construction projects, industry awards and reference letters do reflect a company’s accomplishments, the support, time and contributions demonstrated by Alltrade employees reflects the calibre of our team and their commitment to Alltrade values. 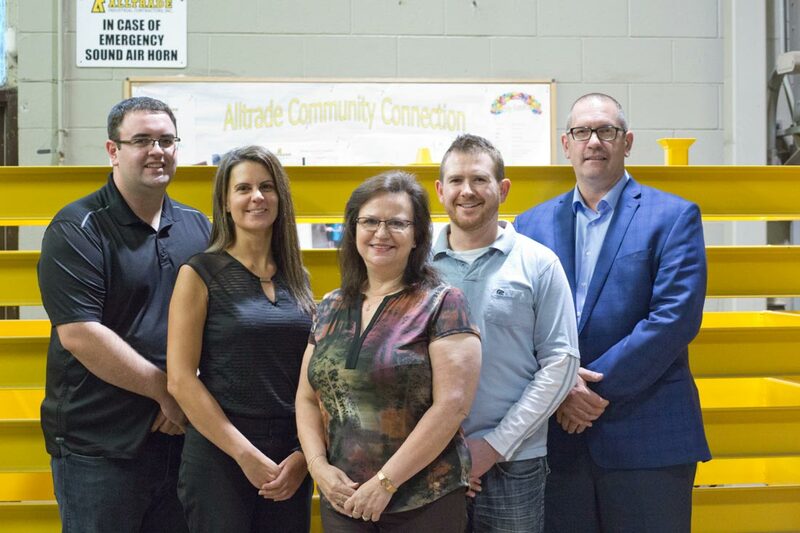 The Alltrade Community Connection supports various charities and projects in our local community and worldwide. We are very proud to say that the Alltrade Community Connection is completely directed and run by our employees. Alltrade provides financial support to non-profit organizations including the Ontario Gleaners, Cystic Fibrosis Canada, Skatelife and Lisaard House. We host fundraisers to support the Galilean Home, and volunteer our time and resources to the Nutrition for Learning Program at local community schools, providing healthy food choices to ensure that children have the proper nutrition in their daily meals. Our international work is a source of great pride for Alltrade. Alltrade employees have the opportunity to travel to Africa to build schools for orphaned children. In Africa, we provide supplies, equipment resources and manpower to help build schools, with frequent breaks for impromptu soccer games with the kids. We are working hard to build lives and helping others achieve their potential. Won’t you join us?